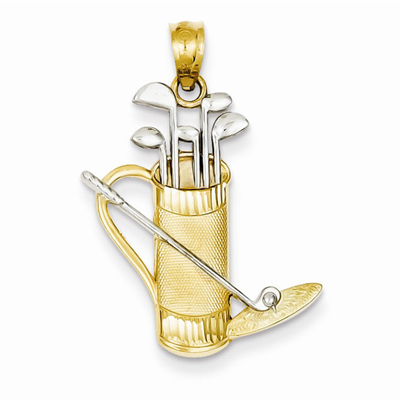 Ogle this golf inspiration gold pendant as you celebrate one of America's favorite past times. The diamond cut design of the golf bag pendant has an open back and is set in 14 carat yellow gold and rhodium with textured touches and a polished finish. Measures 28mm in length and 19mm in width. We guarantee our Golf Bag Pendant in 14K Gold and Rhodium to be high quality, authentic jewelry, as described above.